Lead is a dense, soft, low-melting metal. It is an important component of batteries, and about 75% of the world's lead production is consumed by the battery industry. Lead is the densest common metal except for gold, and this quality makes it effective in sound barriers and as a shield against X-rays. Lead resists corrosion by water, so it has long been used in the plumbing industry. It is also added to paints, and it makes a long-lasting roofing material. Lead is a health hazard to humans if it is inhaled or ingested, interfering with the production of red blood cells. Its use must be carefully controlled, and several formerly common uses of lead are now restricted by the U.S. government. Lead paint is found in many older buildings, but it is now mostly used on outdoor steel structures such as bridges, to improve their weatherability. A lead compound called tetraethyl lead was added to gasoline as early as 1921 because it prevented the "knocking" problem of high-compression automobile engines. However, most gasoline now contains no lead, because lead from car exhaust was a major source of air pollution. Lead is also commonly used in glass and enamel. In television picture tubes and computer video display terminals, lead helps block radiation, and the inner, though not the outer, portion of the common light bulb is made of leaded glass. Lead also increases the strength and brilliance of crystal glassware. Lead is used to make bearings and solder, and it is important in rubber production and oil refining. Lead production dates back at least 8,000 years. Lead was used in Egypt as early as 5,000 B.C. , and in the time of the Pharaohs it was used in pottery glazes and as solder. It was also cast into ornamental objects. A white lead paint was also used in ancient Egypt, Greece, and Rome. Ancient Rome used lead pipes for its extensive water works. Some of the toxic effects of lead were also noted as early as the Roman era, though lead was also thought to have positive medical qualities. In the 15th and 16th centuries, builders used lead as a roofing material for cathedrals, and lead was also used to hold together the different panels of colored glass in stained glass windows. The first lead battery is credited to a French physicist, Gaston Plante, who invented it in 1859. By 1889, so-called lead-acid storage batteries of the modern type were being commercially produced. Modern lead mines produce about 3 million metric tons of lead annually. This is only about half the lead used worldwide; the remainder is obtained by recycling. The top producer of lead is Australia, followed by the United States, China, and Canada. Other countries with major lead deposits are Mexico, Peru, Russia, and Kazakhstan. minerals commercially mined for lead are cerussite and anglesite. Over 95% of all lead mined is derived from one of these three minerals. However, most deposits of these ores are not found alone but mixed with other minerals such as pyrite, marcasite, and zinc blende. Therefore much lead ore is obtained as a byproduct of other metal mining, usually zinc or silver. Only half of all lead used yearly derives from mining, as half is recovered through recycling, mostly of automobile batteries. 1 The first step in retrieving lead-bearing ore is to mine it underground. Workers using heavy machinery drill the rock from deep tunnels with heavy machinery or blast it with dynamite, leaving the ore in pieces. Then they shovel the ore onto loaders and trucks, and haul it to a shaft. The shaft at a large mine may be a mile or more from the drill or blast site. The miners dump the ore down the shaft, and from there it is hoisted to the surface. 2 After the ore is removed from the mine, it is treated at a concentrating mill. Concentrating means to remove the waste rock from the lead. To begin, the ore must be crushed into very small pieces. The ore is ground at the mill, leaving it in particles with diameters of 0.1 millimeter or less. This means the individual granules are finer than table salt. The texture is something like granulated sugar. 3 The principal lead ore, galena, is properly known as lead sulfide, and sulfur makes up a substantial portion of the mineral. The flotation process collects the sulfur-bearing portions of the ore, which also contains the valuable metal. 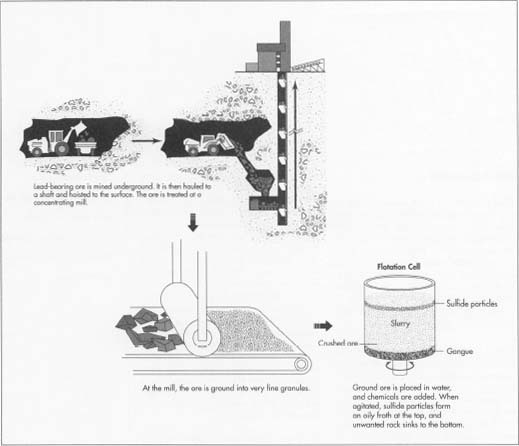 First, the finely crushed ore is diluted with water and then poured into a tank called a flotation cell. The ground ore and water mixture is called slurry. One percent pine oil or a similar chemical is then added to the slurry in the tank. The tank then agitates, shaking the mixture violently. The pine oil attracts the sulfide particles. Then air is bubbled through the mixture. This causes the sulfide particles to form an oily froth at the top of the tank. The waste rock, which is called gangue, sinks to the bottom. The flotation process is controlled by means of X-ray analyzers. A flotation monitor in the control room can check the metal content of the slurry using the X-ray analysis. Then, with the aid of a computer, the monitor may adjust the proportion of the chemical additive to optimize recovery of the metal. Other chemicals are also added to the flotation cell to help concentrate the minerals. Alum and lime aggregate the metal, or make the particles larger. Xanthate is also added to the slurry, in order to help the metal particles float to the surface. At the end of the flotation process, the lead has been separated from the rock, and other minerals too, such as zinc and copper, have been separated out. 4 After the ore is concentrated in the flotation cells, it flows to a filter, which removes up to 90% of the water. The concentrate at this point contains from 40-80% lead, with large amounts of other impurities, mostly sulfur and zinc. It is ready at this stage to be shipped to the smelter. The gangue, or rock that was not mineral-bearing, must be pumped out of the flotation tank. It may be dumped into a pond resembling a natural lake, and when the pond eventually fills, the land can be replanted. 5 The lead concentrate fresh from the filter needs to be further refined to remove the sulfur. After the concentrate is unloaded at what is called the sinter plant, it is mixed with other lead-bearing materials and with sand and limestone. Then the mixture is spread on a moving grate. Air which has been heated to 2,550°F (1,400°C) blows through the grate. Coke is added as fuel, and the sulfur in the ore concentrate combusts to sulfur dioxide gas. This sulfur dioxide is an important byproduct of the lead refining process. It is captured at a separate acid plant and converted to sulfuric acid, which has many uses. After the ore has been roasted in this way, it fuses into a brittle material called sinter. The sinter is mostly lead oxide, but it can also contain oxides of zinc, iron, and silicon, some lime, and sulfur. As the sinter passes off the moving grate, it is broken into lumps. The lumps are then loaded into the blast furnace. 6 The sinter falls into the top of the blast furnace, along with coke fuel. A blast of air comes through the lower part of the furnace, combusting the coke. The burning coke generates a temperature of about 2,200°F (1,200°C) and produces carbon monoxide. The carbon monoxide reacts with the lead and other metal oxides, producing molten lead, nonmetallic waste slag, and carbon dioxide. Then the molten metal is drawn off into drossing kettles or molds. drossing kettle at a temperature just above its melting point, about 626°F (330°C). At this temperature, any copper left in the bullion rises to the top of the kettle and forms a scum or dross which can be skimmed off. Gold and silver can be removed from the bullion by adding to it a small quantity of zinc. The gold and silver dissolves more easily in zinc than in lead, and when the bullion is cooled slightly, a zinc dross rises to the top, bringing the other metals with it. 8 When the lead has been sufficiently refined, it is cooled and cast into blocks which may weigh as much as a ton. This is the finished product. Lead alloys may also be produced at the smelter plant. In this case metals are added to the molten lead in precise proportions to produce a lead material for specific industrial uses. For example the lead commonly used in car batteries, and also for pipe, sheet, cable sheathing, and ammunition, is alloyed with antimony because this increases the metal's strength. 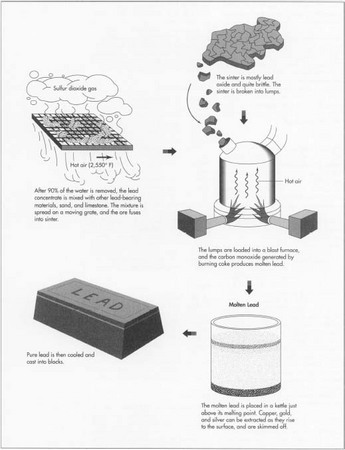 Lead refining produces several byproducts. The gangue, or waste rock, accumulates as the ore is concentrated. Most of the minerals have been removed from the rock, so this waste is not considered by the industry to be an environmental hazard. It can be pumped into a disposal pond, which resembles a natural lake. Sulfuric acid is the major byproduct of the smelting process. Sulfur dioxide gas is released when the ore is roasted at the sinter plant. To protect the atmosphere, fumes and smoke are captured, and the air released by the plant is first cleaned. The sulfur dioxide is collected at a separate acid plant, and converted to sulfuric acid. The refinery can sell this acid as well as its primary product, the lead itself. Air pollution can result from lead processing as well. The smelter requires a "bag house," that is, a separate facility to filter and vacuum the fumes so that lead is not released into the atmosphere. Nevertheless, lead particles do reach the atmosphere, and in the United States, federal regulations attempt to control how much is allowable. Most of the solid waste product produced by the smelting process is a dense, glassy substance called slag. This contains traces of lead as well as zinc and copper. The slag is more toxic than the gangue, and it must be stored securely and monitored so that it does not escape into the environment or come in contact with populations. New developments in the lead industry seem aimed less at improvements in the manufacturing process than towards finding new uses for the lead itself. Since a large proportion of the lead mined and recycled is sold to the automotive industry for batteries, lead producers are quite dependent on the health of the auto industry. But lead producers are interested in finding new applications for lead to give them more market stability. One recent new application for lead is a lead-fiberglass laminate. Lead sheeting can be laminated between gypsum and fiberglass, forming a superior duct material that helps isolate noise. If this is used in an air conditioning unit, for example, it effectively dampens the din of the machine. Another prospective market for lead is in nuclear waste containment. Safely storing radioactive material is a growing concern around the world. The lead industry is researching canisters made of titanium with an inner layer of lead or lead and plastic, contending that a one-inch layer of lead could add 880 years to the life of a properly buried container. And looking to the cars of the future, researchers in the U.S. and several other countries have been studying ways of improving lead-acid battery technology in order to power electric cars. Goodwin, Frank E. and Dodd S. Carr. "Brilliant Performer." Natural Science, July 1989, pp. 317-23. King, Angela. "Producers Hunt New Lead Uses." American Metal Market. April 11, 1988, pp. 10-13. Knights, Mikell. "Higher Auto Output Boosts Lead, Zinc Use." American Metal Market, August 6, 1993, pp. 5-12. Schmitt, Bill. "Lead, Zinc Vie for Place in Future Electric Cars." American Metal Market, August 6, 1993, p.6.